Dynamic milling is a strategy that is becoming more and more popular due to its improved material removal rates while still maintaining process security compared to traditional milling strategies. Incorporating two different machining strategies creates the concept and allows advantages not realized before. Radial chip thinning is the first strategy exploited in dynamic milling. 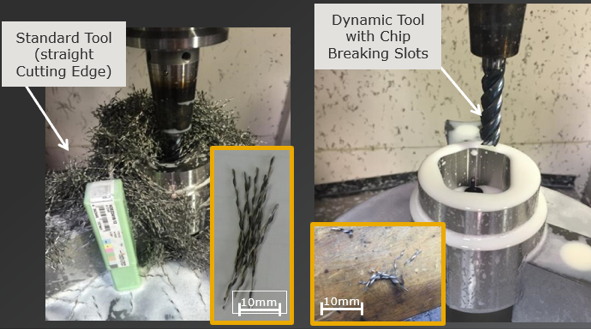 This is the phenomenon of creating a smaller chip by engaging a small percentage of the tool diameter (less than half). When less than half the tool diameter is engaged in the cut, the average chip thickness is less than the advance per tooth. 10-20% radial engagement of the tool diameter results in a significant reduction in average chip thickness, and we need to be aware of this. The average chip thickness should still meet the tool manufacturer’s recommendation for chip load. If it doesn’t, then we are not maximizing the tool’s capability. It also can result in the chip not being physically large enough to hold the heat produced by the cutting operation. A small chip has less capability to hold heat which results in either the tool or the workpiece absorbing this latent heat, which is undesirable. Feeding the tool faster is the solution to preventing excessive radial chip thinning, which is a nice “solution” to incorporate. Light radial depths of cut produce a chip thickness that is smaller than the actual advance per tooth. If machining applications were only in a straight line, light radial depths of cut would be all that we need to monitor. As we all know, parts come in all shapes and sizes with some being very complex. Machining in a straight line is normally not an option, we have to machine in pockets, internal corners and curved surfaces. So controlling the radial engagement is not enough. A better parameter to monitor is the Tool Engagement Angle (TEA). This is the angle drawn from the point where the tool enters the material, through the center of the tool, and back to the point where the tool exits the cut. 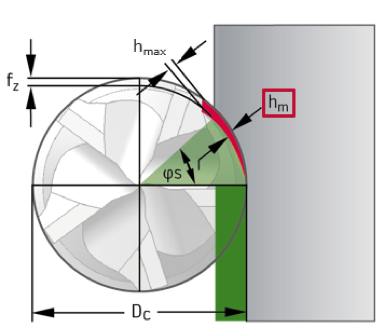 By holding this engagement angle constant, the tool is always in a controlled situation. In this environment, we always have the same cutting condition. We can confidently rely on the radial chip thinning which allows us to feed at elevated sfm, depth of cut, and feed rates while using tools with higher number of teeth and longer cutting edge lengths. We can do this because we do not have to worry about over engaging the tool or chip packing. 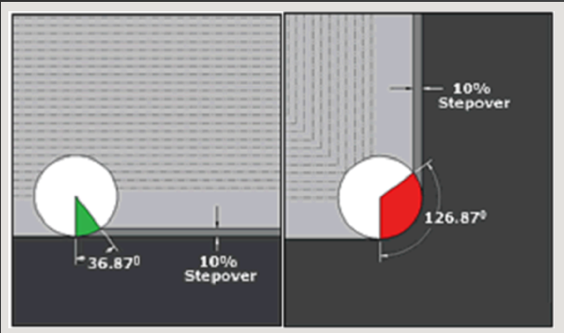 Incorporating Dynamic milling on the shop floor requires resources from three specific areas. A machine tool controller with sufficient processing capability is necessary. A dynamic milling program is going to have a lot of lines of code which must be read efficiently and quickly. A CAM system capable of writing dynamic milling code is also required. The software needs to calculate how to create tool paths so that the desired part is created, yet does not exceed the programmed TEA. Finally, a cutting tool with the correct characteristics and capability is required. Cutting tools for dynamic milling are typically of Solid Carbide construction. Long lengths of cut and a high number of teeth allow the dynamic milling process to maximize material removal rates. Coolant through the tool is not required since the milling is never confined in slots or pocket corners. The chips are easily evacuated without coolant, or if the material requires coolant, external coolant can be easily applied to the cutting zone. Chips are also typically very short in the radial direction. They are however typically very long in the axial direction. This chip configuration does have a tendency to cling together and create problems with chip evacuation in deep pocketing applications. Chip splitters along the cutting edge can break the chip in the axial direction eliminating this problem. Due to long axial depths of cut, including chip splitters on the tool can provide a significant advantage in controlling the chips. Walter USA has had a keen focus on support for customers who utilize the dynamic milling strategy in their shop. The cutting tool manufacturer created a line of solid carbide milling tools which incorporate all the necessary tool characteristics required for this application: MD133. This well-balanced number of flutes allows both high feed rates while maintaining enough chip space to avoid chip packing. Necessary chip splitters are also incorporated in a staggered configuration so that the chips are broken in the axial direction, yet do not affect surface quality of the finished part. 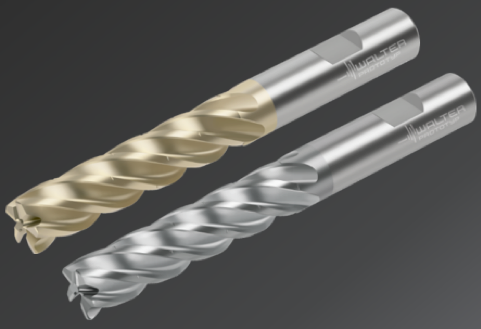 Walter’s MD133 tools are specifically designed for Dynamic Milling and are offered in several coatings for a perfect match between tool and application. Dynamic milling is an efficient way to machine parts that also offers better process security. 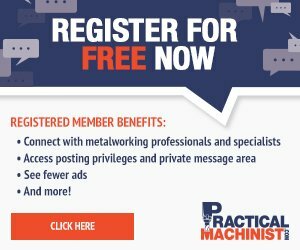 Machines capable of Dynamic Milling, software that can write the appropriate code, and tools with the correct features are all required to implement on the shop floor. But once the process has been correctly implemented, production rates will go up while cycle times can come down along with production costs. Author: Luke Pollock, Product Manager at Walter USA, LLC,. Waukesha, WI.